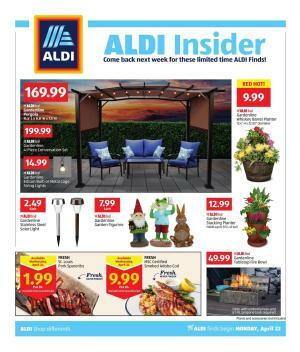 ALDI Ad Apr 21 – 27 Preview featuring new food, grocery, household deals. 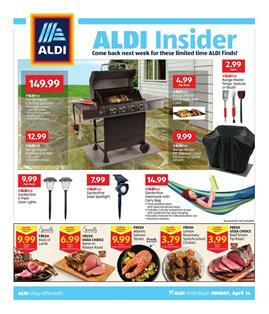 In the latest ALDI deals try to find what you need for this week. Maybe this week’s special sales help you save more. Also, look for the coupon matchups if available. In-ad sales and deals of digital coupons or printable coupons are really profitable together. ALDI sometimes offer various products like outdoor sales. ALDI ad always contains something useful. Give it a try and mind its product range while listing your shopping items. Read our posts that would lead you to top deals provided by retailers. 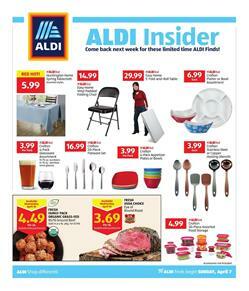 ALDI Weekly Ad Preview is available right now. Browse next week's beautiful products. You'll be able to buy a gas grill, Gardenline planters, potting mix, and more. Range Master 4 burner gas grill will cost only $149.99! Browse the fresh-cut meat on the first page. Fresh products like rack of lamb, bone-in ribeye roast, Atlantic salmon steaks are on sale. The relatively narrow range of products of ALDI is in fact very useful because these products are normally more expensive in other stores. Crofton porcelain kitchenware offers are on pg 3. If you replace the old items of your inventory of the kitchen, it can be motivating and easier to cook. Find indoor clothing or sleepwear in the same part of the Ad. Earth Day products are environment-friendly produce. Organic pillow, sheet set, and more interesting offers are available on pg 4. View more than this in the ALDI Ad Preview. Follow the Facebook page or subscribe to the category to track the ALDI Deals. You have plenty of time to browse this ALDI Ad Preview because the deals are effective starting on Apr 7. You can find nice prices for home products like Easyhome chair. Pay only $3.99 for 4pack of Crofton appetizer plates or bowls. 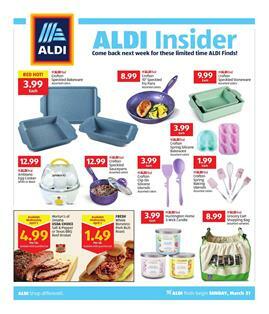 ALDI Insider Ad shows some food items, too. Fresh family pack organic grass-fed is going to cost $4.49! Redecorate your backyard to have a comfortable corner there. 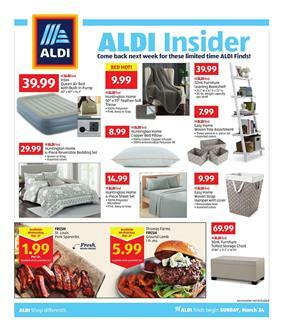 ALDI Weekly Ad sales are important things that I think you should know about. Gardenline rattan storage accent table is gonna cost only $29.99 at ALDI Stores this week. ALDIFind deals with garden accessories can also be interesting for you if you are keen on buying something for your backyard. Gardenline rattan-style solar outdoor lantern is only $6.99 which is a red hot deal. Use power tools to boost the performance of your gardening works. Gardenline 3-in-1 gas lawn mower will cost $169.99! I think these are pretty fair prices for a durable quality of useful items. ALDI Ad and other kinds of sales can help everyone save a lot on some necessary products like these. Find more items in the browsable ALDI Ad pages and grab the best discounts. Subscribe to the newsletter to get emails about the future weekly ads or the in-store ads of this retailer. Protect your chairs when you are not home with feather-soft throw. Buy good looking storage furniture with ALDI Ad prices. ALDIFind deal on SOHL furniture leaning bookshelf makes it only $39.99. Browse the bedroom deals as well. Huntington Home 4-piece reversible bedding set is only $29.99 starting on Mar 27. Taste a delicious meat product from the ALDI Stores. Thomas Farms fresh ground lamb is on sale and it will be only $5.99. Make things easy and comfortable while cleaning your house. Buy home appliances and add something to your inventory. ALDI offers EasyHome handheld wet/dry vacuum for $19.99 only. Another discount is that of the Easy Home steam mop. Get your garden ready for the new season. Gardenline raised garden bed will cost $29.99 at ALDI. Celebrate Easter with sweet candies and the popular brands like Cadbury. The price of Choceur premium chocolate Easter bunny is $2.29! Brands like Starburst, Cadbury, Snickers, Twix, and more are also available. Visit the final page to see pet products. Buy a treat or gift for your little fella. Heart to Tail pet collars will cost only $3.99 at ALDI stores.